This past Saturday, I joined some other members of Think Galactic for a theatrical outing—The House Theatre of Chicago's performance of Diamond Dogs at the Chopin Theater. Diamond Dogs is a stage adaptation of the Alastair Reynolds novella of the same name: a kind of horror-survival story set in the far future, transhuman space opera world of Reynolds' Revelation Space universe. Saturday's production also featured a pre-show discussion with Reynolds himself, as well as playwright Althos Low (pen name for Steve Pickering & others) and director Nathan Allen. I've been meaning to see more of the SFF-allied theater in Chicago, and I am *so glad* I made it out to see this—really quite a spectacle, not shying away even slightly from the science-fictional elements, and with some pretty brilliant tech—props, costumes, puppetry, light & sound—it pulled them off surprisingly well. Reynolds' talk was interesting—shed some light on his writing practices and influences. 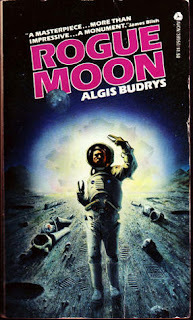 If you haven't read any, his work is firmly centered in the "hard/space-opera revival" area of SF. Speaking of his beginnings, he talked about his unpublishable first efforts and getting past the fear of the novel—"just 500 words a day, and eventually you've got one", as well as slowly finding his publishing niche: not so much the literary, New-Wavey, Ballard-y stuff, but the resurgence of Hard SF exemplified in writers like Stephen Baxter & Paul McAuley. Reynolds also talked a bit about the construction of his primary future universe, called after the first novel set therein, Revelation Space, until something better occurs to him. He mentioned Niven's "Known Space" universe as an influence, and of course one also thinks of other examples like Banks' Culture or Cherryh's Alliance-Union works. 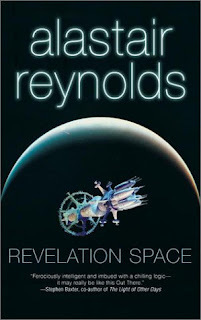 Reynolds noted that the rules of such a universe (like "no FTL") as well as consistency maintenance when writing at different points in the chronology ("funny how no one mentions the world blowing up that one time") is restrictive, but winds up being pretty constructive in terms of story-building. He also freely admitted to some of his more blatant borrowings, like the "melding plague" (from an Ian McDonald story) and the real-time participatory democracy from Joan D. Vinge's The Outcasts of Heaven Belt (which I really want to read now). Noting the perennial problem that "utopias are tough, fictionally", he talked about using other formats in that setting—"24 in space", for instance, and mentioned works as various as The Name of the Rose, The Dirty Dozen, and The Avengers (show not superheroes) as influences on his Revelation Space works. 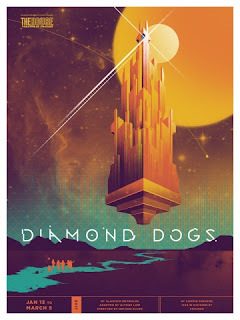 As to how the House Theatre settled on Reynolds for theatrical material, Pickering & Allen talked about wanting to push the boundaries of what they could pull off, technically, and credit a google search for "sci-fi space opera horror noir" with leading them to Reynolds' Diamond Dogs. 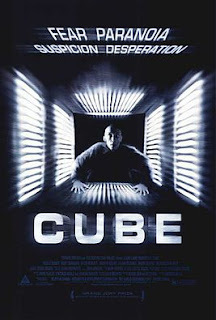 The three of them talked about some of the horrific or sublime influences at work in both versions, including the space-suited claustrophobia of works like 2001, a variety of "deadly maze" works (including clear allusions to Budrys's excellent Rogue Moon and Natali's 1997 film Cube). Reynolds also talked a bit about how mountaineering inspired the work, which actually threw the novella into context for me—Reynolds at one point had an interest in climbing, which was how he met his wife, and the tales of how extreme climbers are driven to sacrifice bits of themselves, their relationships, their lives, just to "triumph" over something that doesn't care--one can totally see that at work here. If you're an SFF fan with even the tiniest interest in live productions, you should see this. And there's only the rest of this week to catch it. The thing you have to see is how well this pulls off visual science-fictionality, live, right in front of you. I don't got to a ton of theater, but to see this level of technical ambition and creativeness pulled off a few feet away from you—this isn't some huge Broadway production dimly seen, you're right up on top of a tiny stage—is really impressive. 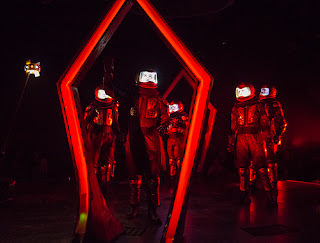 Costumes were perfect (I was stunned by how well they recreated and used the "internally lit helmet" visual trope), audio & light cues astonishingly well-used, and the fairly minimal, dynamic set-pieces worked extremely well. The effects really peak with the puppetry—both the drone seen early in the play, and the titular diamond dogs in the last act. The move from human actors to puppetry at a vital moment might seem foolhardy, but it was probably the most affecting part of the play for me. Puppetry designed by Mary Robinette Kowal, by the way, who's also an accomplished SF author. There were a few rather sub-optimal technical aspects, primarily having to do with sight lines. I really do applaud the decision to stage this in the round—having the audience seated entirely around the action emphasized the live, theatrical nature of the production; one worries that the same effects on a traditional proscenium stage would seem too "screen-like". However, the raised stage played poorly with my ability to see the action and actors at several points, especially since the stage also included different raised columns in many scenes. Where the play really falls short, though—and I have to put on my mean critic hat for a second—is the script. 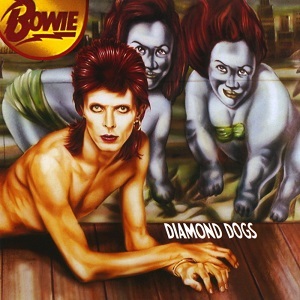 And the reason the script fails—double-mean hat, here—is that it's far too much like Diamond Dogs, the novella. Usually I'm all for maximally faithful adaptation, but the source material here is not kind to the project of making an engaging script. To wit: Diamond Dogs lacks sympathetic characters, relies heavily on clunky exposition, and has a situation that, while variously weird & horrific, is not actually compelling. The mountain-climbing inspiration is a little too apt (without meaning to offend the climbing community): extremely privileged dudes tackle an ultimately meaningless project, thoughtlessly sacrificing lives and limbs—their own or their assistants, no matter. Furthermore, that idea—of characters transforming/sacrificing themselves almost arbitrarily—seems to be the key thing Reynolds is interested in. The actual challenges set by the spire are almost macguffiny: cartoonish "really tough math problems" that Reynolds stops trying to share with us once he's established that they're too smart for most of his characters (or readers). It really is just Cube with a few extra dongles tacked on. This doesn't make for good characters, nor dialog. Furthermore, the decision to rigorously follow the text of the novella makes for a play that is full-to-bursting with as-you-know-bobs: exposition galore, and telling, rather than showing, the plot and emotional implications of every act. The script sounded overwhelmingly crowded, with actors rushing to get all their clunky exposition out, and it felt as though they were in danger of stepping on each others' lines in almost every scene. As a result, it's hard to even evaluate the actors: there was too much script in the way. Joey Steakley's rendition of the cyborg Dr. Trintignant was easily the most memorable: the character's appearance accomplished much on its own, necessitating rather less exposition, and, despite or perhaps because of face-obscuring prosthetics, Steakley's physical presence on stage was more nuanced and distinct than the rest of the cast. Elana Elyce's Hirz was the most organic-feeling presence on the stage, but the way the character is treated—verbally abused and casually murdered by a privileged man, with no-one speaking up for her—is pretty squicky, and a few Think Galactagons were also a bit suspicion of the decision to drop a kind of "sassy black woman" trope so uncritically here. And yes, you'll hear some Bowie. All that said, seriously, go see this. I can feel my old theater directors shaking their heads at me from hundreds of miles away, but: the spectacle is worth it. 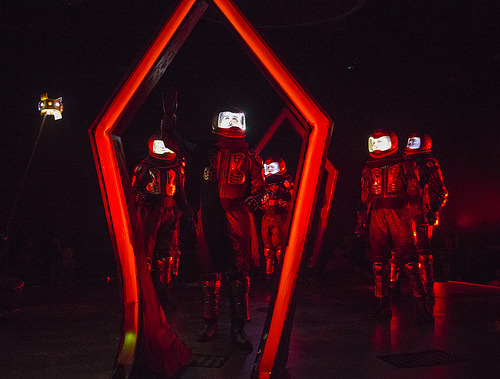 Whatever its failings at a script level, its a genuine attempt to create a science-fictional feel in the theater, not shying away from technical challenges or awkward speeches about cryosleep. It's intriguing to think about what this kind of technical approach could accomplish if the exposition were stripped out—afterwards, were talking for a little bit about SF films that explain themselves vs. those that don't, Under the Skin being an interesting example of the latter (and also perhaps a response to The Man Who Fell to Earth). Go check this out, it's only playing for a week more.